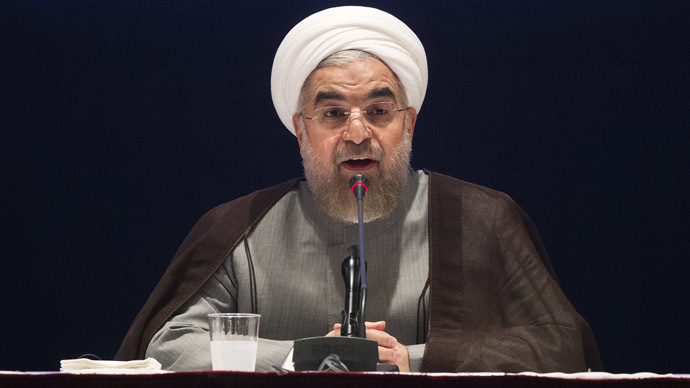 Iranian President Hassan Rouhani has said Iran will keep its promises if the other side does, referring to Thursday’s preliminary nuclear agreement. “The world has acknowledged Iran is pursuing its peaceful objectives,”he said during a press conference on Friday. Rouhani said Tehran’s nuclear enrichment issue “is not a threat” to any other nation, and if the other sides keep their promises under the deal Iran will too. "If we've given a promise ... we will take action based on that promise. Of course, that depends on the other side acting on their promises too," he said. He added the deal is a big step forward for the Islamic republic as it legitimizes Iran’s nuclear program before the international community. “We have defended our sovereignty,” he said, adding Iran’s nuclear program “threatens no one.” He elaborated that many countries have been engaged in nuclear fuel production, and the deal would lift restrictions that hinder Iran’s economic growth. “It’s a breakthrough not only in the nuclear sphere but in many others,” he said. Rouhani looked forward to the “positive changes” in the lives of Iranians that would follow the deal. “And before June 30 we have to make the most important step on the conclusion of the final agreement,” he said. On Thursday, Iran and world powers reached an agreement on Tehran’s nuclear program following eight days of talks in Switzerland. The results will serve as a framework for a future comprehensive nuclear agreement between Iran and the six powers, to be concluded by a June 30 deadline. The agreement would see Iran enriching uranium to 3.67 percent, which enables the creation of nuclear energy, but is not enough to build nuclear weapons. Iran would be obliged to cut its centrifuges from 19,000 to 6,104, with 5,060 for enrichment. Tehran would also cut the amount of uranium stockpiles it keeps from 10,000 kilograms to just 300 kilograms and increase transparency with the International Atomic Energy Agency (IAEA) by providing access to all nuclear facilities in the country. The Fordow facility is to be converted into a nuclear physics center and would contain no fissile material. The heavy water research reactor in Arak would be redesigned so it can’t produce weapons grade plutonium. It was also agreed that the Natantz facility would remain the only uranium enrichment complex in the country and there will be no reprocessing of uranium. The spent fuel will be exported. The US and EU agreed to lift all nuclear-related economic and financial sanctions in exchange for Iran’s commitment to its obligations under the deal. The sanctions would be eased after the IAEA verifies Iran carried out key obligations. Most of the international community has voiced support for the proposed agreement on Iran’s uranium enrichment plan. On Friday, Iran’s close-ally Syria welcomed the outcome. Syria’s foreign ministry issued a statement saying it hopes the framework of the agreement will be followed by “positive steps and will be another contribution by Iran ... to ease tensions in the region and the world." Moscow said on Thursday that the deal would help the security situation in the Middle East, partly because Tehran would now be able to take more active part in efforts to solve conflicts in the region. Speaking at the White House on Thursday, US President Barack Obama was positive about the preliminary agreement, which he called a “historic understanding” that would prevent Iran from obtaining nuclear weapons. Israel, implacably opposed to a nuclear Tehran, has condemned the proposed deal. After a meeting with his cabinet on Friday, Netanyahu expressed concerns about Israel’s security, adding that Iran must recognize the Jewish state’s right to exist under the nuclear agreement. “I want to make clear to all. The survival of Israel is non-negotiable,” he said. “Israel demands that any final agreement with Iran will include a clear and unambiguous Iranian recognition of Israel's right to exist." The Israeli PM has in the recent past tried to get the US Congress to impede a diplomatic solution offered by the P5+1 negotiations. Following his visit to Washington in March, 47 Republican senators signed a letter written by Arkansas Senator Tom Cotton, which threatened to pull any nuclear deal reached with Iran after Obama leaves office. “Not everything you’re hearing from the Israeli government is an accurate depiction of the talks,” State Department spokeswoman Jen Psaki said.